Queen Victoria discussed the "horrid" Irish and Russians in private correspondence with Disraeli, according to papers of the Scots-born prime minister Arthur Balfour (1848-1930) held by the Brander family of Whittingehame, East Lothian. Britain's longest reigning monarch also told Disraeli she wished she were a man so she could go and fight enemies of her empire. In November 1919, a Buckingham Palace aide wrote to Balfour, then in the Cabinet as Lord President of the Council, asking for advice about the proposed publication of letters between the Queen and Disraeli. The following month Balfour wrote back suggesting that a number of the Queen's remarks be removed from the letters, dating between 1875 and 1878, to protect her reputation. Balfour wrote: "There is a phrase used by the Queen in which she talks about giving the 'horrid Russians such a beating.' I rather like the Queen's passionate wish 'to be a man and go out and fight her country's enemies.' All the same, these are expressions which rather degrade sentiments which are in themselves wholly admirable." Balfour also called for the passage where the Queen referred to "these horrid Irish" to be removed before publication. He wrote: "No doubt the Irish party of obstruction in the House of Commons was horrible, but I cannot help feeling that this colloquial commentary might, with advantage, be omitted. It is somewhat schoolgirlish. If I have seemed to cavil at words, it is not because they are too vehement, but because I think they will be misunderstood and will injure rather than improve the general effort of this remarkable piece of political portraiture." Balfour added: "Without being in the least clever, Queen Victoria was certainly a most remarkable personality. Unfortunately she wrote like a schoolgirl, incapable of seeing the reality behind the form." 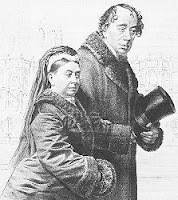 Shown here: The Queen and Disraeli. It is interesting to see how the view of Victoria has changed. I feel that during her rule she grew and developed as a women and queen. This is expressed clearly in her writing. However, the current popular perception is of a much more homogenous monarch. If you look at her reaction to the Crimean war and then compare this to the Boer war, you clearly see a shift in her attitudes and approach.